20" x 29" x 16" & 19" x 21" x 14"
"Saddle Stools" is a pair of stools, but they are not identical twins. They are siblings with many similarities yet different enough to tell apart. Each one has a slightly different shape and seam pattern. They also stand in different positions: one steps forward (the ringleader), while the other briefly hesitates (the sidekick). Like many siblings before them, they will be in equal amounts of trouble regardless of whose idea it was. Childhood photos of the artist and her younger brother provided inspiration for these playful stools. 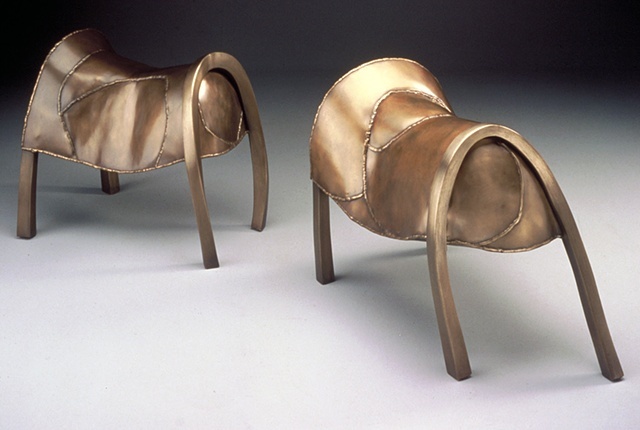 The bronze leg segments were cast with lost wax process, and the bodies were formed and welded from sheet bronze. The weld beads were left in place to mimic the visible topstitched seams in leather saddle work.